Gyeon Bathe is a high end shampoo that will help you remove various contamination fast and easy. For most vehicles, imperfections and paint defects come from poor washing and drying products and techniques. A two-bucket method and high quality wash media can only partly guarantee success. If you want to take your washing to the next level, you need to add in a high quality shampoo. Gyeon Bathe is extremely slick, allowing the high quality particles to encapsulate dirt and grime, while lubricating the surface. This allows you to glide your wash media across the surface, safely removing harmful dirt and grime. 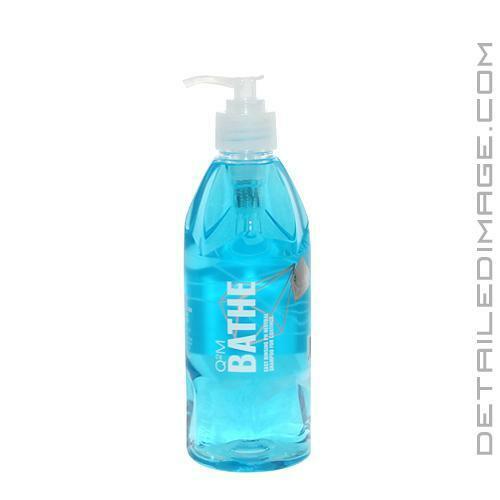 Bathe is extremely concentrated and carries a dilution ratio of 500:1. This allows you to play around and find the exact dilution that works for your personal detailing, along with carrying a great value with every bottle purchased. This high end formula is also pH neutral, making it a great maintenance shampoo for paint already protected by a coating, wax or sealant. It will not negatively affect your protection, and delicate finishes such as nickel, chrome plated, or highly polished metals. With a great deal of suds and the high lubricity mentioned before, Gyeon Bathe is a product you will be proud to add to your detailing collection! Easy rinsing PH neutral shampoo for coatings. Powerful cleansing action restores and maintains maximum surface gloss. Poor 20 - 30ml into a 10 - 15 liter bucket. Wash entire car with a soft, wool mitt in a straight motion, starting from top. Dry with a suitable drying towel. I picked this up to compare side by side with Bathe Essence. Both have the same cleaning power as I confirmed that with Gyeon. Overall Bathe is a real nice shampoo with real nice lubricity. The only issue I have is the price for the amount of shampoo to use. Thi shampoo is my go to car soap or bath soap. I have tried this product and I am very happy with how it works. I test different products all the time because I want to be able to give my clients quality. This shampoo is a quality product and I will keep using it for a long time.